Model T Ford Forum: Year of this Model T.
Year of this Model T.
Model T Ford Forum: Forum 2014: Year of this Model T.
Can anyone tell me what year they think this Model T is? I was told it is a 1923. The wall in between the engine and your knees is made of wood, and the door panels and inside of the cab has some wood in it for support. Also, what is the correct name for this type. From what I have seen on the internet, is it a Model T Roadster Pickup? Thanks in advance for any input. It is a Model T Roadster Puck-Up. However, it appears to be a mix or years. The radiator and hood look like 1915-16. The front fenders and cowl look like 1917-23. Also, just because it has a pick-up box does not necessarily mean it started out as a pick-up. It could easily be a roadster that someone converted. Take a look on the drivers side of the engine. In the middle near the top is the water inlet. Just above that the engine serial number should be stamped into the block. Post that here and we can tell you what year the engine is, which may or may not be the same as the car. The engine might be 1923. What's the serial number? Pick up box is 1925. Radiator is 1916 or earlier. We'd need lots more pictures. Good for parts, or play with it as it is. Not a candidate for restoration. I imagine that is not the information you were hoping for. It looks like it is a vehicle made up of Model T from various years... The firewall is from a 1915. The pickup bed is after 1925 to 1927. The wheels are from 1919 or later. The body looks like it might be a late teens touring body with the back cut off. With the starter cables hanging out of the back it would appear to have an electric starter which makes the motor post 1919. As I said, it is made up of bits. Have fun with it. had to do. It is what it is; if it could speak.. Thank you all for your responses. This is my first Model T and my first time on a forum like this, so again, thank you all for your help. I know it is not the prettiest thing out there, but it runs good and we have fun in it. I will check out the engine serial # and get back to y'all. Thanks again. Model T's are like girls, they're ALL pretty!! As much as I don't normally like modified cars, that one has a good old fashioned, natural look about it. It is complete and useful as a pickup too. I would leave it just the way it is and enjoy it. Here's the information Dan suggested, along with another page for every new Model T owner. Todd -- We Model T'ers don't turn our noses up at "put-together" T's, unlike Model A folks or Packard folks or any of those other snooty car groups. The guys here were just telling you what you have there, which is what you asked. 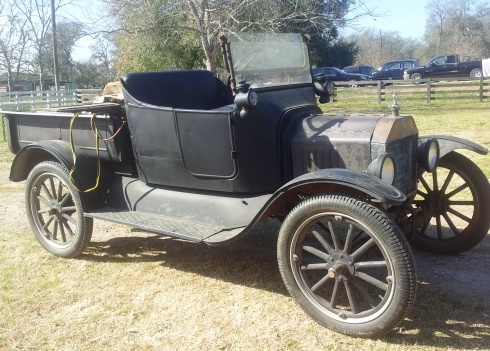 The typical Model T went through a lot of changes during its lifetime, from new car to used car to the car out behind the barn which doesn't run anymore, to the WW-II scrap drive. LOTS of them were converted to pickups later in their lives to get more use from them, and LOTS of them have parts from later years. Henry made the T's to have interchangeable parts over many years, so if you crunched a fender and went to the dealer for a replacement, you might get a later fender which would fit, but look different. Same with many other parts. The thing is, most of our cars have later parts to some extent, some more than others. But you won't get kicked off a tour if you bring that car, and it's no less fun driving one like yours that it is a "correct" one. As some have mentioned above, it would be a chore to restore your car to be correct for any particular year, since it has many years' parts on it. But if it turns out that it is a car which had parts replaced one at a time, rather than being a put-together car, you could consider that part of its history and respect its "experience." As Henry P. said, "Model T's are like girls, they're ALL pretty!! "